Today’s blog post is from Eric Grumdahl, Policy Director, U.S. Interagency Council on Homelessness and was originally posted on www.USICH.gov. These remarks were delivered at the National Human Services Data Consortium conference, Minneapolis, MN, on May 2, 2014 during a plenary session. Thank you all for the opportunity to be with you today. I feel like I’m in a room of kindred spirits: people eager to solve complex technical problems in the service of complex social problems. Although I now work in DC, I cut my teeth on HMIS and other data systems right here in Minnesota. I’m probably the geekiest USICH director to address this conference. Thanks for having me. As many of you probably know, USICH is a small, independent Federal agency responsible for coordinating the Federal response to homelessness across the big 19 agencies on the Council. The Council itself is composed of the heads of those agencies, with HUD Secretary Shaun Donovan serving as our Chair for 2014. For all of you gathered together today for this conference to help us use data to solve tough social problems, I’m personally grateful for the work you are doing on homelessness and bring the greetings and appreciation of the Obama Administration with me. I know your loved ones, school buddies, and distant relatives may not really understand what you do. “Something to do with data and IT.” I want you to know that this Administration does understand what you do. Thank you, for helping to build the infrastructure for social change. Today, thanks to the infrastructure you build and maintain and enhance and use, most places in our nation have access to readily available, regularly refreshed local data on the magnitude and nature of the problem and the impact of our various interventions and responses. That is critical progress, but as many of you know, that is just the beginning. Today, I want to reflect on our data about homelessness: how we’ve used it and how it has shaped our response to the problem; how we need to push ourselves to use it better today; and how are data and practice might evolve together. First, how we’ve used data. Since the launch of Opening Doors in 2010, we have measured national progress on the goals of the Federal strategic plan to prevent and end homelessness using the annual Point-in-Time count and Annual Homeless Assessment Report data. The story the data tell is compelling, showing unprecedented decreases in homelessness throughout a challenging recession, with progress led by decreases in Veteran and chronic homelessness. I’m sure most here know the statistics, but they bear repeating: since 2010, Veteran homelessness has decreased by 24 percent. That’s one in four. Chronic homelessness has dropped by 16 percent. Unsheltered homelessness across all populations has decreased by 13 percent, with a 30 percent decrease among unsheltered Veterans. How this has happened is a story of courage and dedication and hard work among thousands of people who experienced homelessness and thousands more who supported them. It is also a story about our data. Let’s talk about the linkages between data and investments and impact. The Federal budget is the most powerful vehicle for establishing the Administration’s priorities. It is not a wish list: investments proposed in the budget telegraph both what the Administration values but also the confidence that an investment made will have commensurate impact. As you can probably imagine, when the Administration develops its budget, there are many, many important and worthy efforts that vie for attention and funding. Every proposal, every detail has to withstand the scrutiny not only of the Administration’s best and brightest trying to eke every ounce of impact out of every dollar, it also must be ready for the scrutiny of the taxpayers, the media, advocacy groups, and the Congress itself. To do all of this, it is not enough to be good and important; big investments require strong evidence of impact. You know that this Administration has committed to ending homelessness. Ending it, not managing it. We know that ending homelessness requires big investments. I say all of this because I want to convey the full meaning and weight of this fact: The President’s fiscal year 2015 budget proposes the investments needed to end Veteran homelessness in 2015 and to end chronic homelessness in 2016. To end it. A decade ago, imagining this level of investment may have strained belief. Homelessness is no more worthy or important today than it was then. One of the most important things that has changed is our data. Today, we have a track record to show of investments that have yielded impact. We have a better understanding of the problem than we have ever had. We have an ability to forecast — that is, to quantify — the impact of the strategies that will help us reach this bold and ambitious goal. And we have developed new, more effective and cost-efficient approaches to ending homelessness. All of that owes a debt of thanks to the data that we’ve assembled and that the systems you build collect, manage, and analyze that data. These benefits of data in the context of the Federal budget also apply locally — perhaps even more so. Data help elected officials and Continuum of Care leaders who want to propose changes or investments in at least two important ways: first, data on impact and effectiveness will help us make sure that these changes are for the better. Using data to guide changes means we are following the evidence, not ideology and not inertia. Second, having strong data provides cover — political or otherwise — to help us be bold in those decisions. We have 20 months until we have committed to end Veteran homelessness. Now is a time for courageous action, not half-measures. All of this progress and the role that data have played in it are exciting. Let me pause now and recognize that we have not arrived. We still have a lot of work to do. My portfolio at USICH includes our work on Veteran homelessness, youth homelessness, and homelessness among Native Americans. Across those overlapping populations, we see huge differences in terms of access to data. VA has some of the best data available on homelessness, and a national center led by Vince Kane with Dr. Dennis Culhane as the head of research to understand what VA’s data say about how to end Veteran homelessness, and how to apply it to practice. In contrast, our work on youth homelessness and homelessness among Native Americans routinely confronts the limits of our data, and what we know that we don’t know often stymies our most earnest efforts to advance solutions. Again, remember that advocacy for new funding must be grounded in evidence of impact. That’s why the Federal framework to end youth homelessness sets out two equally urgent strategies: to improve our data on youth homelessness while at the same time building our capacity to respond. There are many parallels with our work on Native homelessness, but we have much further to go. Wilder Research’s partnership with tribal governments to conduct a survey on homelessness on reservations is one of a few bright spots we can point to nationally. Apart from filling in our knowledge gaps, how else does our data on homelessness need to evolve? The investments proposed in the budget will only get us to the goal if communities and providers make the hard, ethical decisions needed to use those resources to their greatest effect — to target resources wisely based on people’s needs, not just filling vacancies or service slots. To make sure that we are investing in the programs that yield housing outcomes as cost-effectively as possible, not just supporting all the programs we’ve supported because that is the easy, default thing to do. We know that ending homelessness, like all social change, is hard. But, for the first time ever, the Federal government has proposed investments that can take us to the goal, with your help. Our data are powerful, but too often, in far too many communities, we’re not really using that power fully. Helping communities use resources wisely is neither easy nor always popular work. I am here to tell you that it is critical to our success. How many folks here either offer or use an HMIS system with built-in ways to help communities understand the relative impact of various programs in achieving housing outcomes, in a way that illuminates differences between the people engaged? Labor Secretary Perez recently compared this kind of analysis to competitive diving, where divers’ scores are based on both the execution of the dive and the degree of difficulty. To understand the impact of programs, we need to understand both who they engage as well as their effectiveness. HMIS has a critical role to play illuminating both sides of that question. Are we using that capability well? How many of your systems help service providers identify and engage Veterans and people experiencing chronic homelessness in real time? If you are working in communities that are still taking a first-come, first-serve approach to outreach efforts and in access to critical resources, are they aware of the alternatives? Do they know how other communities are doing it differently, and the impact that targeted engagement and access to resources has on moving the needle? This is happening in places like Salt Lake City and should be happening more broadly. Targeting resources is obviously linked to your work on coordinated assessment, but you do not need to wait for your coordinated assessment system to be fully developed to improve targeting. How many systems have links to mainstream data systems, so that data that originated in a school or public assistance department or a hospital or a jail can help you focus on who is being engaged through those systems but doesn’t have their housing needs met? The data on who is homeless exist in HMIS, and the data on who uses emergency room frequent exist — why wouldn’t we have those two systems talking to each other? Yes, there are legal hurdles and technical challenges. But it is possible, and we should be doing it. How many support outreach and engagement in the field? I don’t mean “yes, I guess you could load the webpage on a smartphone,” I mean really useful mobile features and functionality? There are communities like Houston that are making data available in a street outreach context that not only facilitate connections to housing, but also to other resources like health care coverage. Without minimizing the challenges — technical, financial, legal, and otherwise — if we are not doing these things now, what are we waiting for? These are the kind of things data systems are good at and the kinds of problems that people in this room can solve. By now, I suspect everyone in this room will have read and absorbed the new HUD data standards released yesterday afternoon. Actually, in this room, I think that’s possible. Here’s what I hope you see in the evolution of these standards. First, a bold — truly courageous — decision to make the HMIS data standards a tool that serves purposes broader than reporting to HUD. At USICH, we live in this interagency space all the time, and it is wonderful and inspiring to see an agency take something good, something that has had a transformative impact like the HMIS data standards have within HUD’s programs and across our efforts to end homelessness, and make them as useful to other agencies as they have been to HUD. Thank you, HUD, especially to the SNAPS team led by Ann Oliva and a special shout out to Karen DeBlasio, who’s work on the new data standards makes them what they are. As you probably know, for the past several years, HUD has been working with its partners at HHS and the VA to shape the data standards in a way that reflects the values that their grantees bring to your community. The data standards are better because of their involvement in the process. This cross-jurisdictional application of HMIS means work in the field can be organized better around people instead of disconnected reporting requirements, to simplify some of the administrative complexity that exists right now and to align our semantic understanding of homelessness across programs. Using HMIS across programs also means that a single data standard can span the expertise of multiple agencies: we are making HMIS smarter on youth homelessness by bringing in the wisdom of HHS’s Runaway and Homeless Youth Act grantees; HMIS is better on Veteran homelessness because VA’s Supportive Services for Veteran Families (SSVF) grantees use the system. And I don’t mean “smarter” just in terms of the data standards — I also mean that we’ll actually have better data about individuals and families experiencing homelessness in the system as well. For some of you, the data standards will support work your communities are already doing to address homelessness across populations and funding sources. For others of you, the new standards may lead to growing pains in your community, as additional stakeholders are being brought to the table and being held to the high standards you are setting for your data. I know these transformations can be painful, and I know that your systems don’t reprogram themselves overnight. Thank you for the work to create this kind of alignment and to use HMIS as a platform for this kind of evolution. This is tremendously important work. The structural changes to the data standards also mean that the data can be more and more useful to practice. They are evolving in a way that support the work that case managers and outreach workers and supportive housing programs do every day. Some of you have heard me talk about the need to shift from a compliance orientation in our use of HMIS to a focus on supporting practice — the actual eligibility determinations and resource allocation decisions that should be informed by all of this data. Again, coordinated assessment already pushes us in this direction. The new data standards take some important steps in this direction structurally in clarifying the stages and frequency of data entry and in helping communities think about HMIS as a community-wide system instead of a siloed reporting database for each specific program. The changes help us understand homelessness locally, by making destination-at-exit a universal data element collected for all programs and tracking homelessness chronicity. I think these new data standards are important and exciting, and I hope you agree. Now I want to turn to the last part of my talk: how do we think about the future? If what we can dream to be today is based on what we know today, what might we dream? Frames have several purposes. They align participants with certain ideologies and beliefs, they challenge existing beliefs, and they create new perceptions of reality. As such, frames are important in the development of social movements that, by definition, seek to challenge the status quo. –David Wesley, “Social movement heterogeneity in public policy framing: a multi-stakeholder analysis of the Keystone XL pipeline” (2014). Law and Public Policy Dissertations. Paper 16. Data standards are, themselves, a form of framing. They articulate a paradigm — a frame of reference in which we elevate some things as important over others, where we define a scope of options that are anticipated to be possible or at least most probable. We can derive and refine these standards or this paradigm from experience, but experience itself is also mediated. There is no fixed Archimedean point from which to evaluate the merits of each paradigm. Our view is partial, and so is every other view. So what do we want our view to convey? As part of the Homelessness to Housing Stability Strategy for the Region of Waterloo in southern Ontario, Canada, the Region of Waterloo Social Service has a language guide that suggests reframing our discussion from focusing on homelessness to focusing on housing stability. Yesterday, you heard Cathy ten Broeke, Minnesota’s Director to Prevent and End Homelessness, talk about how in Minnesota, focusing on housing stability has engaged stakeholders in finding options to end homelessness that a focus on homelessness alone may not. In addition to the practical and strategic considerations about this reframing, let’s recognize that this also focuses us on the solution, it defines the response in terms of the future we seek. One of the things I have really appreciated about working for USICH is that my documents are never edited for brevity when I use person-first language. Person-first language is not about political correctness. It is about conceptual clarity. It is about choosing not to perpetuate the mistaken notion that homelessness is a characteristic of a person, rather than an experience that people survive and that remains fundamentally a social artifact, not a quality of someone’s character. It is also about respect. I guess I would rather be known as a person within a bureaucracy than as a bureaucratic person. So, let’s challenge ourselves to keep people first in how we frame the problem in our thoughts, in our concepts, and in the words we use. 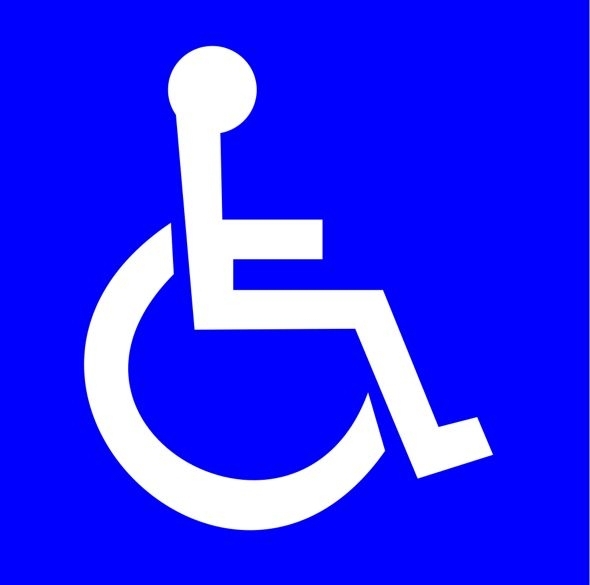 Slate’s The Eye design blog recently ran a piece asking the question whether the international symbol of accessibility needed to be redesigned. These icons provide a powerful example of how the framing of our concepts embeds all kinds of beliefs, assumptions, and ideologies. 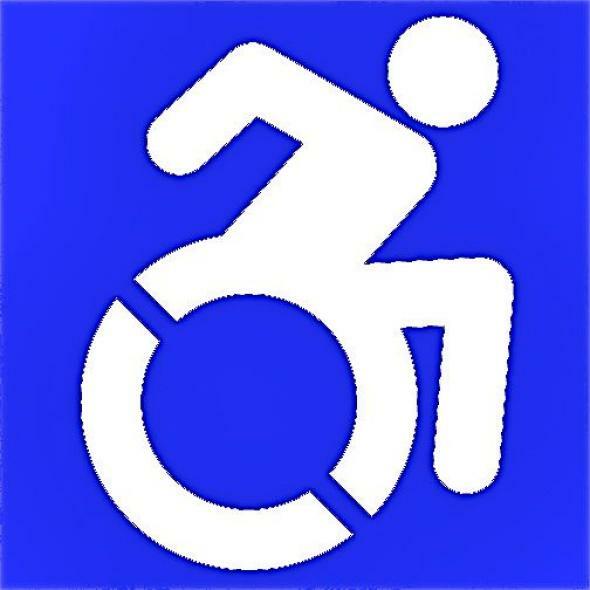 Comparing these two symbols, ask yourself which wheelchair you would you prefer to use. We cannot avoid our frames being laced with assumptions and beliefs. But we can try to bring those assumptions into view, and my challenge to us all today is that we think hard about the beliefs that we want to hold. If an end to homelessness is increasingly in sight, how do we envision the end in the way that we frame the problem today? If we are going to end homelessness, what do our data systems and what does our homelessness response system — or our housing stability system — need to look like as we do? public health world have been here before. The health impact pyramid developed by Dr. Thomas R. Frieden in theAmerican Journal of Public Health suggests the answer, in calling for increasingly population-based responses, to change the context and socioeconomic conditions so that people at risk of homelessness are predisposed to housing outcomes, not bouts of homelessness. Interestingly, this shift mirrors the same semantic and conceptual shifts we just talked about — moving from focusing on one person’s homelessness as the problem, to focusing on the environmental and contextual factors that determine whether risks of homelessness lead to exposure to homelessness. This table suggests how these concepts from the public health world might apply in the context of housing stability. But what does this mean for our data systems? A lot, I suspect. Let me call out three key points. First, if we recognize that context shapes homelessness, how is context part of the story of homelessness that we tell? Do we describe that homelessness exists in a context of unprecedented worst-case housing needs? At a local level, do we quantify the availability of affordable housing alongside our population measures of homelessness? Do we frame homelessness in the context of parallel efforts to improve access to skills and employment? If not, why not? Homelessness Analytics, a collaborative effort of VA and HUD, can help situate data on homelessness in the context of other social indicators. Second, as population-based responses to homelessness become more and more essential to taking us across the finish line, how are our efforts — and our data systems — linking to the broad population-based services delivered through our health care and economic assistance systems? If we think about effective prevention, we cannot wait until someone shows up at shelter — that is too late. So, how are we engaging these mainstream systems to help identify people in danger of becoming homeless to intervene appropriately early and to make those mainstream systems an essential part of the response? This work must happen locally, and our data systems can support it happening well. ・ In the past two months, have you been living in stable housing that you own, rent, or stay in as part of a household? ・ If not, are you worried or concerned that in the next two months you may not have stable housing that you own, rent, or stay in as part of a household? More than 4 million Veterans have been screened to date, and Veterans experiencing homelessness or at risk are referred to appropriate services. Can we imagine a world in which we could say the same about every hospital visit? We need your help — and your data systems — to get there. Big questions, big opportunities. I think it is a measure of our success to date that they are becoming increasingly relevant ones. So, in closing, let me say again, thank you for the work you do. Thank you for the progress that has been driven by the data you painstakingly collect, analyze, and improve. We are at an exciting and critical time in the history of our nation’s efforts to end homelessness. Thank you for your partnership to make sure that we have the full benefit of the data in your systems and the human stories they tell as we bring about an end to homelessness in this country, and safe and stable housing for all.